An example of the kinds of questions that TripAdvsior Forum and its experts can help you with was a topic that comes up regularly – ‘All Inclusive’ packages. Many guests are drawn to the notion of all-inclusive so they can truly relax without worrying how much more in ‘extras’ they are going to rack up at the end of their already wallet-biting holiday. But what is included in ‘AI’ packages varies dramatically. 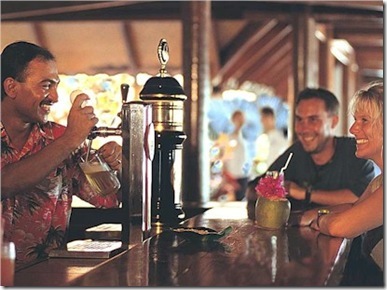 Typically, they do include drinks, but some resorts have only a limited selection of drinks available to AI guests and all other drinks are extra. Some activities are included and others are not in places. 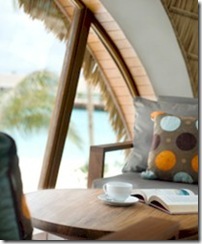 In my research for various esoteric details about the Maldives resorts, the assortment of online forums are invaluable resources for tapping into the broad and deep expertise out in the world of both visitors sharing their experiences to afficionados who are Mastermind experts on the subject of the Maldives. 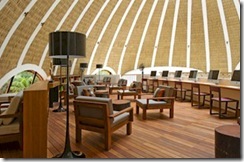 Most of the prominent travel publications offer forums (eg. Fodors, Frommer, Lonely Planet), but they all absolutely pale in comparison to the grandmaster of them all: TripAdvisor. I track, access and participate in the other forums from time to time and find that they get entries maybe once a week on average. 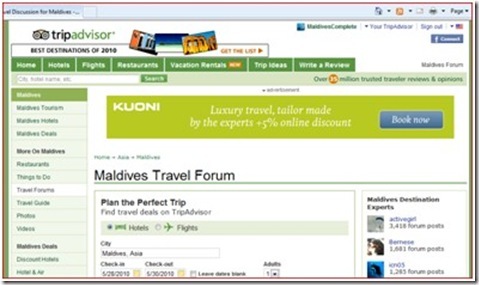 TripAdvisor can get entries every hour just on the Maldives. Moreover, on other forums, your question will often linger unanswered. TripAdvisor posts typically get some sort of response within the day and can trigger dozens of replies for a particularly intriguing subject. The greatest asset, though, are the ‘Destination Experts’. These are people with a knowledge of the Maldives as deep as their passion for them. The top expert, ActiveGirl, has 3,418 forum posts to her credit. And the other top contributors all have over 1,000 themselves. In addition, to the unparalleled expertise that is generously shared out, the forum is one of the few that I have been to that truly lives up to the notion of being a ‘community’. A lot of the participants know each other and many of the posts are done with humour and levity and good natured banter. Helpful Tips – Some of the newbies to the forum jump right in with big, broad questions like ‘I’m going to the Maldives on my honeymoon, where is the best resort?’ Try to focus your questions a bit by giving some of your key concerns, preferences, etc. The more specific and challenging the question, the more assistance the experts can provide. Secondly, if you do have a specific question, given TA’s hoard of over 15,000 posts just on the Maldives, there is a very good chance that someone has already asked it, so use the search facility on the site to see if you can’t find the answer straight away without having to do a post. Many Maldives bedrooms have some distinctive views and the water bungalows certainly give you that up close view of the aquarium-like ocean around. 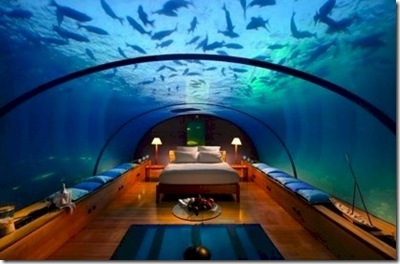 But if you want more up close and more aquarium and more ‘surround’ than ‘around’, then the big news out of the Maldives this month is the introduction of Conrad Maldives Rangali’s ‘underwater bedroom’ experience. Rangali has taken what was one of the all-time best ‘Best Of’ features (and the very first featured on Maldives Complete), the Ithaa underwater restaurant, and extends the use of this great space during the graveyard shift by transforming it into a bedroom. Gives a more inspiring connotation to the colloquialism ‘sleeping with the fishes’. 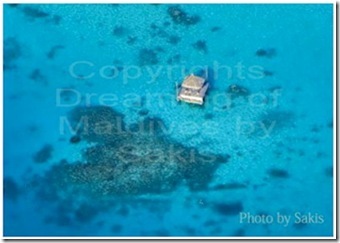 Dreaming of Maldives, another of Sakis creations both inspired another ‘Best of’ selection as well as a bit of a treasure hunt to figure out exactly where it was (see the comments section on his site). 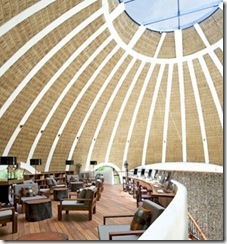 Many resorts offer some exclusive pavilion for a special or romantic meal. Of course, for that ultimate in secluded romance there is the off shore, on a sand-spit BBQ that some resorts can arrange for you as a special excursion. But if you want that off shore remoteness with the comfort and solidity of your own little pavilion, then you need to go to Taj Exotica. If you can believe it, you can go to the Google Map on the Taj Exotica profile and see it for yourself. 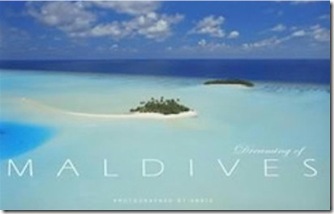 The startling natural beauty of the Maldives has inspired legions of photographers professional and amateur alike. A design choice of MaldivesComplete was to have the iconic imagery of the blues and whites filling the browser page as the background so that visitors would sort of feel immersed in this distinctive locale while you conducted your investigation. If your holiday snaps don’t quite capture the breathtaking beauty you recall from your visit, then a whole range of online sites offer piles to choose from. In the public sites, like Flickr and Facebook, you can find some truly marvellous images. But if you want a sure fire collection of some of the most dazzling pictures ever captured, the top Maldives photo site has to be ‘Dreaming of Maldives’. Sakis, the photographer behind it, is offering a special deal of free 2010 calendar when you buy his photo book. I bought these recently and they are truly gorgeous (and the pictures in the calendar are different to those in the book). I have written on the ‘best’ house reef and the ‘deepest drop off’ house reef’, but one of the most prominent questions about house reefs is which is the ‘closest’. Given the Maldives atoll topology, often the land bit of the island can be surrounded by a quite considerable about of lagoon, which is very shallow waters, before the island structure itself drops off more precipitously into the deeper surrounding ocean. It is this drop off which is most dramatic as lots of marine life cluster and settle on this vertical structure and the larger expanse of water makes room for bigger fish and bigger schools of fish. The problem can be that when you have a far away house reef, one can spend a good 15 minutes of boring swimming/snorkelling over an expanse of white sand shallow lagoon before reaching the house reef main event. The real snorkelling luxury is the close by drop off. 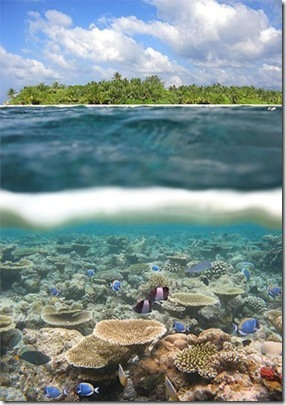 In forums and reviews, people often talk about ‘close house reef’. That refers to the fact that the ‘drop off’ hits pretty close to the beach. I have chosen Vilamendhoo because based on looking at all the resorts, Vilamendhoo appears to have the longest stretch of shore where the drop off is that close. 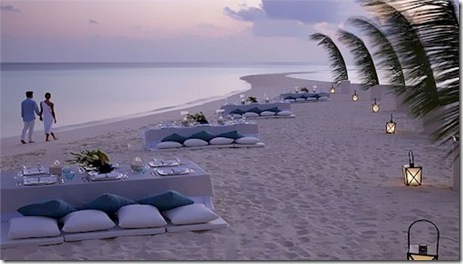 One of our family’s favourite things to do at the Maldives is to eat on the beach. More and more, resorts are offering beach dining as a special event. I hanker for the good ole days of a simpler Maldives when you could simply ask the waiter to move your table from the beach-side restaurant onto the warm white sand with the water gently lapping inches away and a canopy of stars for your ceiling. But if you want to wiggle more than just your toes in the sand, if you want to nestle your whole self onto the beach, then Landaa Giraavaru’s beach dinners at Blu Beach are made for you. No plastic beach chairs or even conventional wooden ones, but a couple of comfy cushions to help you get settled into a truly romantic meal. Most resorts have a library somewhere with a collection of paperbacks for the beach and perhaps a few magazines and board games. Increasingly, resorts are adding Internet access around the resorts and in places like business centres and these libraries. Frankly, I’ve never been tempted to spend any time in these libraries because they were always unassuming rooms and unimpressive places. Sort of a tick in the box to provide that capability. But my recent trip to Kurumba that got hit with a bit of unlucky weather underscored how handy this resort resource can be at times. The newly revamped Kandooma resort has shunned the library as tucked away after thought making its library quite a stunning place that might even tempt me away from the beach even on sunny days.